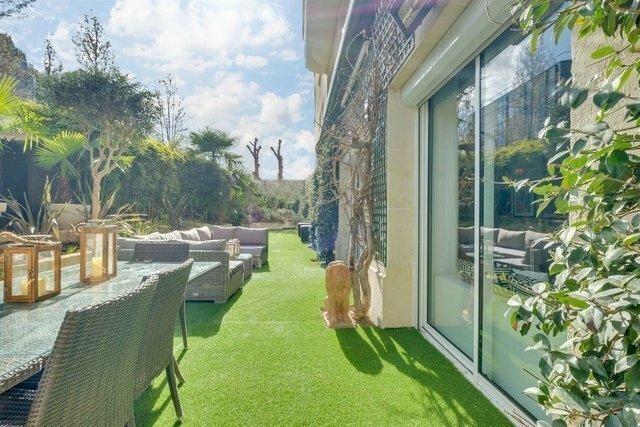 Sole Agent - Neuilly-sur-Seine - Saint-James – In a good standard building, with elegant and renovated common parts, two adjoining apartments, of 110 sqm. and 60 sqm., ideal for a family whishing to live in the same building. « Like a house », with independent entrance, garden level apartment facing South-East, with no buildings directly opposite, peaceful and entirely renovated. The 110 sqm. apartment comprises a generously-sized entrance,a double living room with fireplace opening onto a magificent sunny landscaped garden of 180 sqm., an independent kitchen, three bedrooms, a dressing room, a bathroom and a shower room. Superbly appointed : parquet floor, moldings, fireplace, Sonos sound system and automatic watering system. On the 1st floor, a 60 sqm. apartment enjoying a view on a garden, sunny apartement with no buildings directly opposite. It comprises an entrance, a double living room, an independent kitchen. Two cellars are included. Possible to rent a parking space in the vicinity. Paris Ouest Sotheby’s International Realty.